After those voluminous architectural jackets, perhaps this is a good time to talk about ease levels ! 38 – 36 = 2 in. In practice the amount of ease is a surprisingly complex matter, as it depends on ease of movement, stretchiness of fabric, personal preferences, layering, and design. I’m always wanting to check ease levels, and never seem to find my version of the BMV patterns ease level chart, which I always need to adapt anyway, so here are some comments. The BMV ease table (for non-stretch wovens) is here . Some of us are not a RTW shape and have to buy garments which are huge in most places, just to be able to move without tearing the buttons off in our largest area. . .
Hopefully when we can make our own clothes, we can learn enough about fitting and pattern alteration to get round that problem. Ease is not a simple matter of a few easy rules, as there are different types of ease for different purposes, as well as personal preferences to take into account. Garments made out of very stretchy fabrics, such as lycra leotards, may actually be made smaller than the body. In these modern days of many stretch fabrics with different properties, pattern making books provide several different basic pattern blocks for fabrics with different amounts of stretch. The minimum ease needed to be able to move. For example, if you wore a skin tight garment in a non-stretch fabric, you wouldn’t be able to breathe. The amount of movement ease needed depends on the amount of stretch in the fabric. And people differ in their preferences. Some people want to look sleek, and are happy to go without being able to move easily, to get the effect they want. As in wearing a party dress which is too tight to sit down in. . . In a close fitting jacket, with less than 2 inches of ease, you may not be able lift your arms easily above about 45 degrees. So people who like freedom of movement often prefer 4 inches or more of ease in a jacket. Most casual garments are made with more than minimum ease. One of the problems with getting a good pants pattern is that they have both to look good while standing and feel comfortable when bending over or sitting. There’s all sorts of specialist information available for particular sports, about the different areas of a garment where special ease is needed. Here’s a diagram of the different levels of ease, adapted from the BMV table. This is an ease scale for non-stretch wovens. Each level of ease assumes you want the garment to fit over the next one down : coat over jacket over blouse. Though these days things are not quite so simple. The BMV ease table says jackets are not made close fitting. But I know at least one pattern making book where the jackets are made from the same block as the dress. Which means there’s not room for more than a camisole under, and minimum movement ease. Say 2 in./ 5 cm. Perhaps less if the jacket is the focus of your outfit and always worn closed. A jacket needs to be at least 1 inch larger than what it’s layered over, if it’s going to be worn as a layer over a blouse or shirt. A lined jacket is often made 1 in. larger than an unlined one, for the same reason. Then add at least 1 inch more, for each additional layer. For layering a lined jacket over a sleeved shirt/ blouse, many people prefer at least 4 in / 10 cm. Especially in winter for more layering. And also beware ease of sleeves. Fitted jacket pattern sleeves need to be checked. Many of them assume you’ll be wearing it over only a camisole or tank. So armhole and sleeve are not large enough to be worn comfortably over another garment with sleeves. When you have a well-fitting jacket pattern, you may find you can wear a closer fit and still be comfortable. It’s a matter of personal preference and the usual clothes you wear a jacket over. I need many layers for warmth, like to move easily, and am not close to a RTW shape, so most of my jackets are very loose fitting. A bit bigger than jackets, as they’re usually designed to layer over a jacket. The diagram has the coat ease levels BMV recommend for wearing over a jacket. The BMV ease table says coats are not made close fitting. But I have one coat pattern from them with ease of only 2 inches, obviously intended to be worn only over a top without a jacket. So again, check finished measurements of a coat pattern to make sure you will be able to wear it in the way you expect. Also the suggested ease levels assume the coat is worn over a jacket at the same level of fit. For example, a fitted coat wouldn’t be comfortable over a very loose fitting jacket. There just wouldn’t be room inside the coat for all the extra fabric. The ease added by the designer to give the desired silhouette. For example the 80s – 90s are famous for their huge shoulders and very loose fit. For the last decade or so, fitted or close fitted has been the norm. In recent seasons a ‘slouchy’ look has appeared – very loose fit has returned but without the huge shoulder pads supporting it. The main recommendations are for ease at bust level. Hip level ease applies mainly for skirt, pants, shorts, culottes. But also applies to the hip level of dresses, long jackets, coats. On close fitted and fitted and semi-fitted styles, there’s often one inch less ease at hip level. For example, if the bust level ease is 3 in. then the hip level ease is 2 in. But allow for your personal needs. For example, as my hips spread 4 inches when I sit down, I make sure there is at least that amount of ease at hip level. 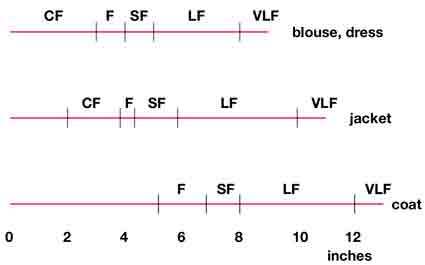 On loose and very loose fitting styles, the finished garment measurements are often straight up-and-down. Hip level is often the same as the finished garment measure at the bust level. But as the ease at bust level is more than 8 inches on these loose garments, that’s usually no great problem – unless your hips are 3 or more sizes larger than your bust. This is all very dry. Ease is not a simple matter, but it is useful to understand how ease works and what your preferences are. This entry was posted on October 12, 2013 at 8:54 am and is filed under fit of clothes. You can subscribe via RSS 2.0 feed to this post's comments. Both comments and pings are currently closed. Great tute on ease. Thanks. Thank you it all makes sense now & just in time for me to make my son jacket this week…. Thanks so much, this is incredibly helpful! I am just about to make my first couple of blouses and have been trying to fathom how much of an fba I really need to do – this has really clarified things for me. Much appreciated! This was SO helpful. Thank you!